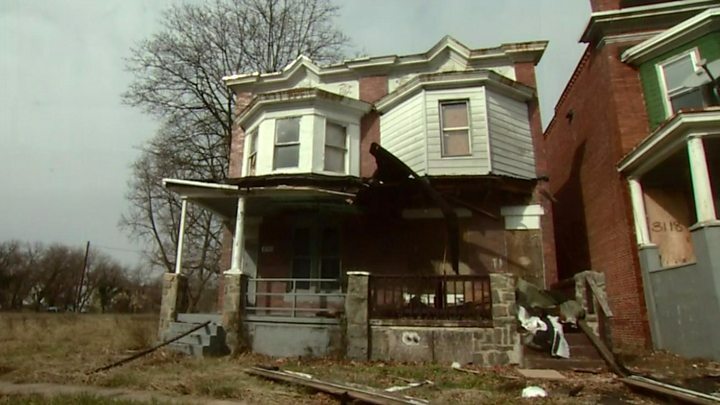 Media captionIan Pannell reports from the city of Baltimore: "Hope has given way to despair"
The number of homeless people in the United States has increased for the first time since 2010. Just under 554,000 people were homeless, a report from the department of housing and urban development said. West Coast cities like Los Angeles, as well as New York, contributed significantly to the rise. Los Angeles saw the number of homeless inhabitants rise to 55,000 - an increase of almost a quarter in a single year. The annual estimate, due to be unveiled later, was seen in advance by the Associated Press news agency. Other cities recording a large increase include Seattle, San Diego and Sacramento. The relatively large increases in those areas have pushed the national figure up by a little under 1%. Speaking to America's NPR radio, Housing and Development Secretary Ben Carson noted that in cities like Los Angeles and New York rents were rising "much faster" than incomes. The government, he added, needed to work with community groups and non-profit and religious organisations, to combat the problem. "We just need to move a little bit away from the concept that only the government can solve this problem by throwing more money at it," he said. Mr Carson and his department have made particular efforts to combat homelessness among war veterans but those numbers also increased nationally, again driven by surge in Los Angeles. Despite the increase, the numbers sleeping rough are significantly lower than a decade previously, when the same point-in-time count was more than 647,000. Why are America's suburbs getting poorer? While the increase is the first in seven years the number of homeless is still 13% lower than the 2010 figure. The counts are conducted by regional authorities on a single night in late January each year and include those sleeping on the streets or in cars as well as those in emergency shelters for the night. The results are then submitted to the federal government to be compiled into national statistics.